I don’t know how I missed the release of this one (actually I do- it’s the announcement of a special limited edition at around the same time as this was released) but the local GW had it on the shelves on Saturday when my boyfriend and I went to pick up this month’s White Dwarf so we bought it then. To be honest, I’m not sure what to make of this book, the stories are all very good but I could have told you that about three of them months ago as the book includes three stories that have previously been released as audiobooks: The Dark King, The Lightning Tower and Raven’s Flight. All three are excellent stories and I really enjoyed reading them but I have to admit feeling more than a little bit cheated when I realised that they were re-releases of existing material. The Crimson Fist by John French is the first story in the anthology and is one of two novellas included. It is the story of the fleet that Rogal Dorn sends to Isstvan and its leader Alexis Polux. The fleet does not reach Isstvan, instead it is trapped in an abandoned star system, Phall, following a Warp storm, the escaping of which destroys a large part of the fleet, leaving the injured Polux the Master of the Fleet. The marooned Imperial Fists cannot get any message out or receive any in turn. The story switches between the fleet and interactions between Rogal Dorn and Sigismund back on Terra. I really, really enjoyed this story. The doubt of Polux is very well written, the arm motif throughout the story is present but not jarring and weaves together Polux’s past and present (and I guess future). Meanwhile the tension that grows between Dorn and Sigismund is believable and understandable and is a microcosm of the general sense of tension and betrayal that the Horus Heresy has brought. The Crimson Fist is an excellent start to the anthology and a brilliant story in its own right. Despite The Dark King and The Lightning Tower being disappointing in that they were previously available as audiobooks, they are both good stories and I enjoyed reading rather than listening to them. They don’t lose anything from the translation to paper and are gripping reads. The next story is The Kaban Project by Graham McNeill and it is a prologue of sorts to Mechanicum. It involves some of the same characters and a certain artificial intelligence. It’s an interesting story, nicely written and adds to the lore surrounding the Mechanicum. It reminded me a little of the classic robot stories by Asimov in tone although the conclusion is considerably darker. This is followed by another former audiobook story, Raven’s Flight by Gav Thorpe. I really like this story as an audiobook and it holds up very well as a printed story. It doesn’t quite fit in with the other stories character wise but tonally it does work well with the other stories in this anthology. Unfortunately Death of a Silversmith fits in less well. It feels like it would have fitted in better in one of the earlier anthologies, or even as just a stand alone download from Black Library. It’s not a bad story per se, it’s just missing something. As a stand alone story it may have shone, but in this book it just fades away in comparison to the other offerings. The anthology finishes with another novella, Death of Crows by Aaron Dembski-Bowden. You can pretty much guarantee that any story by Dembski-Bowden will be good and that any Night Lords story will be excellent and this one does not disappoint. The story follows Sevatar, the aforementioned Prince of Crows just after Curze has been wounded, apparently fatally by the Lion. Dembski-Bowden has made the Night Lords his own and the portrayal of the legion as a band of dysfunctional, antisocial, sociopathic killers is in sharp contrast to portrayals of other legions elsewhere. The only slight niggle with the novella is the Dark Knight like portrayal of Curze. It is inevitable though, given the back story and the similarity is not always unwelcome as it gives an anchoring point when trying to understand the Primarch. I could have happily read a novel length retelling of this story but I also can see that it is the right length as it is so I’m not going to sulk. This novella alone makes Shadows of Treachery worth buying. In the end, despite my disappointment with the inclusion of three previously published stories (I’m not counting Crimson Fist here as although it was available as an e-book a few weeks back, it’s not been available as easily as the others), I honestly enjoyed this anthology. I feel that Death of a Silversmith really did not fit with the other stories, although it does technically fill the brief as a shadow of treachery. However it isn’t a bad story. What bothered me more was a slight lack of variety in the choice of stories. McNeill wrote three of the stories: The Dark King, The Kaban Project and Death of a Silversmith, and while they were all well written, it may have been nice to have had a story written by somebody else. Black Library has a large pool of really good authors and their anthology collections are a perfect way of showcasing their talents. It’s a pity that Shadows of Treachery does not do this. However nearly all the issues that I have with this collection are editorial, the stories themselves are all very much worth reading and for that reason I can strongly recommend this book. So my boyfriend and I went to our local Games Workshop store to pick up this month’s White Dwarf (and Shadows of Treachery, but that’s for another post). I was interested to see what the newly revamped White Dwarf was like. It definitely felt different picking it up. It’s thicker for one thing and I love the different textures on the cover. It feels like more of a modern publication. This isn’t going to be a very detailed review, I’m saving that for a time when I’m not ill and I’d like a few more issues so that I can build up a better idea of what an issue is like before I compare old and new White Dwarf. Over all I have to say that new White Dwarf is an improvement over the old one. The pages can still feel a little crowded but the new layout is not bad. The only thing that I really don’t get is that the “This Month in” section is behind the store finder. I really think that it should be the other way round as not only is it convenient to have to store finder at the back where you know exactly where to look (and yes, I know this is the age of the internet, but the White Dwarf store finder is more convenient than the Games Workshop webpage finder), the “This Month in” section is pretty good and doesn’t deserve to be buried away at the back. There are two things that strike me about this month’s White Dwarf, first is the rise of the opinion piece, even the adverty “New Releases” section has opinions and description in the text, the second is the increase in “outsiders” in the articles. “The Army of the Month” and “The Rivals” sections are actually dedicated to ordinary readers rather than those who work in Games Workshop HQ. This is all to the good. I don’t think I spent more than half an hour on the previous issue of White Dwarf and I’ve been dipping in and out of this one all weekend. Some of that is admittedly down to my drooling over the new Daemon Engines, which, if they weren’t so incredibly expensive would be on my “to buy” list, even though I really need to paint more Space Wolves before I think of starting another project, but a lot of it is down to the increased content. The aforementioned “This Month in” section is really good. There is an article with Phil Kelly and Jes Goodwin on the new Chaos Space Marines codex explaining how and why they have evolved the codex and the models complete with concept drawings. You get the impression that both men really enjoy what they are doing and its nice to get reasons for what has been done. I wasn’t so impressed with the Forgeworld pages but the Black Library interviews were quite good. The modelling side of the hobby is fairly well represented. 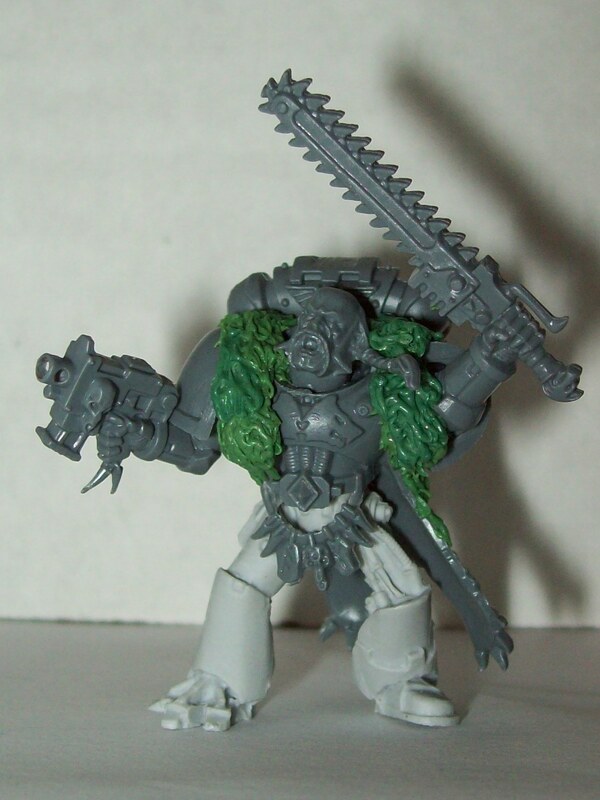 The new conversions section is interesting and I always like to see pictures of other people’s models. The Urdek Refinery board in “Battlegrounds” is rather impractical for people without lots of space, time and money but it’s there more as an inspiration than an instruction sheet. “Paint Splatter” is the new painting section. Again, there are no actual instructions, just paint colour guides. While painting instructions are probably very useful, I can see why they haven’t included one, as while it’s good to show it once, you’d really have to include it for every issue and that would take up a lot of space. The paint guides may even be useful. I like the Daemonfire techniques. It is aimed at the beginner, but to be honest, beginners are the ones that need the leg up, not the semi-pro painter. The “New Releases” section is still far too long, but it’s less of just a catalogue now. Another worry is that this issue is very heavily Warhammer 40K oriented. I am a 40K rather than a Fantasy player, but I imagine anybody who is purely a Warhammer Fantasy player may be a little bit disappointed. At least they get something though, unlike Lord of the Rings (I only spotted one photo of Rangers and a picture of Gandalf). In conclusion I have to say that the new White Dwarf is an improvement over the old one. It’s still far from perfect but I’m going to give it a few issues to settle in before I make my final judgement. 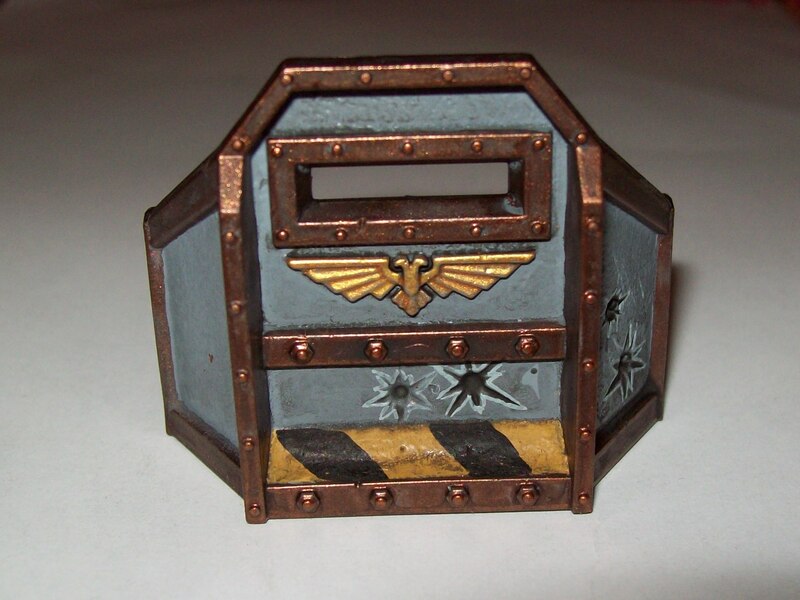 Sorry for the lack of posting this week, I’m not feeling too well (I have an inflammation due to a filling) and I’m spending my evenings curled up on the sofa rather than doing 40K related stuff. I haven’t even removed the cellophane from the new box of bikers. I really need to tidy up my sprues before I do much more but at the moment all I feel like doing is read. Hopefully things will be back to normal by Sunday. This weekend looks like being quite a big one for 40K and I’d like to at least try and enjoy it. This guy has been sitting around unpainted for months now. I know that he was built and undercoated before April as I fielded him unpainted in a game then and I suspect that I built him somewhat earlier than that! 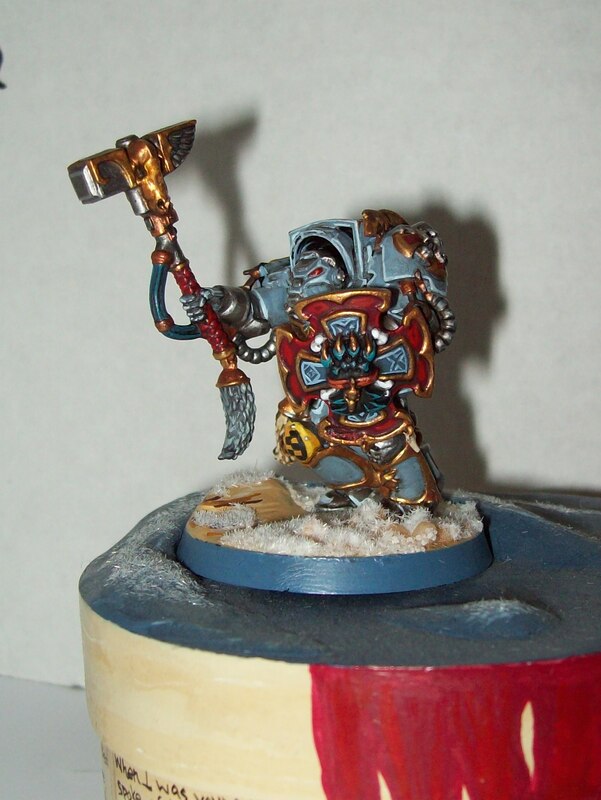 However, he was rather heroic in my last game of 40K so I decided that it really was time that I spent some time on him (and I still can’t get into the mood for painting more Aegis Defence Line barricades). The only thing he really needs now is a name. I’m thinking Thorgrim Something… I’m rather stuck on a last name still. At least now I won’t feel too embarrassed about fielding him! I’ve just started a new job (same place, same boss, very different work) and as a result I’m more than a little bit tired. That’s why I’m going to review a book I’ve owned for a few months now, the Lone Wolves graphic novel by Dan Abnett and Karl Richardson. The Lone Wolves graphic novel is a collection of the comic series originally published in Warhammer monthly. As you can probably tell from the title there are Space Wolves involved in the story, although it is actually told from the point of view of a guardsman, Sergeant Poul Marlin of the Xth Slavok regiment. Marlin and his men are, as far as they know, the only humans left on the planet of Shadrac. It’s frozen, they have no food and they have a bit of a Tyranid problem. Fortunately for them they aren’t as alone as they thought, as, when they need it most, Skold Greypelt’s Space Wolves appear. 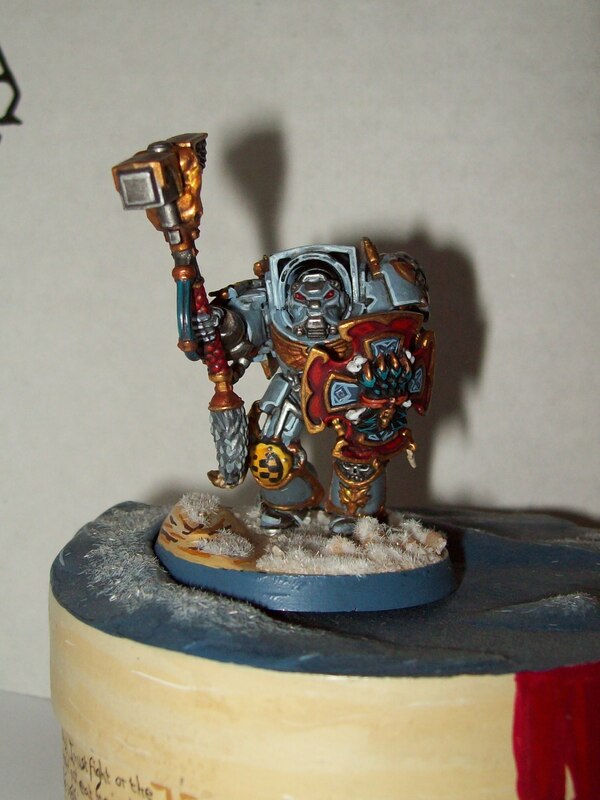 The original story was published back in 2003, but the Space Wolves in this story are more like those in Prospero Burns than the William King Space Wolf books. Actually, there’s something that really confuses me. 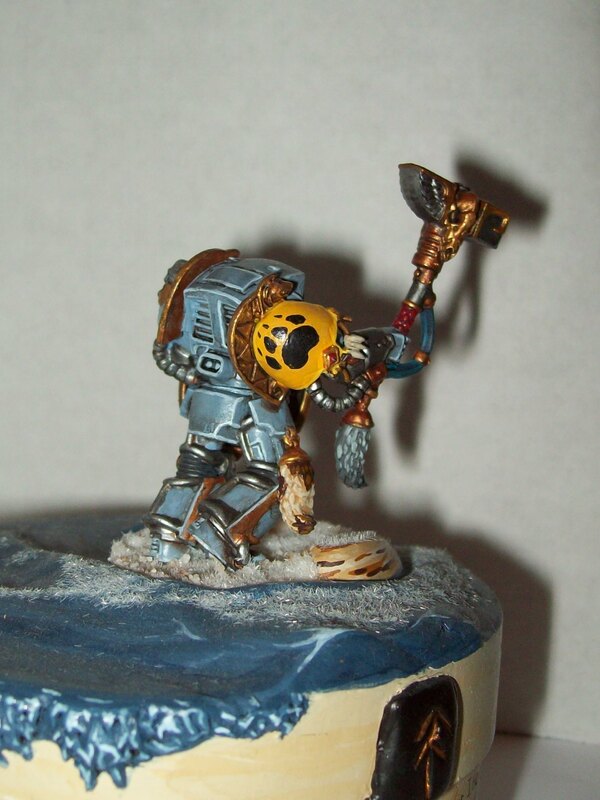 One of the early episodes of The Overlords podcast (episode 15, about 1 hour in) had an interview with Dan Abnett where he mentioned the difficulties he had with writing Space Wolves. I know that graphic novels are different to novel novels but the interview does jar a bit with the book in front of me! Anyway, the story is good, it’s more of an Imperial Guard than a Space Wolf story, but both forces are well portrayed and Karl Richardson’s artwork is stunning! There is an introduction by Christian Dunn that makes me chuckle every time I read it and some information on the Space Wolves at the end which gives an idea of what’s next for the survivors and gives some nice ideas for Space Wolf armies. This is a great graphic novel and I highly recommend it. It’s particularly nice for Space Wolf fans but the storyline and artwork have much broader appeal. At least that’s what I think and I’ve drooled over it for quite a few months now!